I must say I’m excited to see what Loayza has done! 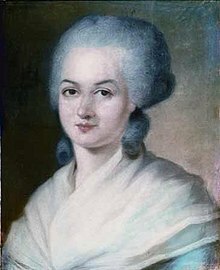 Marie Olympe de Gouges, enfranchiser of women as "homme"
What Bellos is doing with the French translation, then, is recovering Ms. Olympe de Gouges’s role in making meaning, in using language and recovering language for human rights. (Let me just add that what Olympe de Gouges did in France with French so courageously encouraged Elizabeth Cady Stanton and others in the USA, where the clause “all men are created equal” in the Declaration of Independence was reinterpreted explicitly and inclusively as “all men and women are created equal” in the Declaration of Sentiments, written, read, and signed in 1848.) Bellos has also allowed Loayza the French translator of his book a great deal of agency, of generous creativity to make meaning. If you compare just the titles, the English and then the French, then you begin to see how the two “match,” but how the one is not either a formal equivalence or the dynamic equivalence of the other. For Bellos, writing in English, the title is: Is That A Fish In Your Ear? : Translation and the Meaning of Everything. And, for Loayza, translating in French the title is: Le poisson et le bananier. 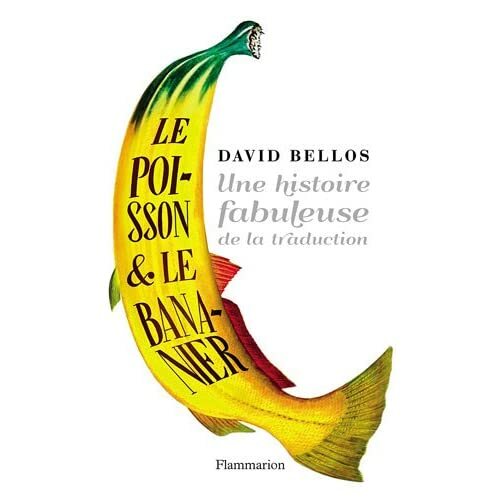 Une histoire fabuleuse de la traduction (which back-translated into English means The Fish and the Banana Tree: A Fabulous History of Translation). The fish of the English title refers to the Babel Fish, from Douglas Adams’s Hitchhiker’s Guide to the Galaxy, which is not widely known in France. In order to keep “fish” in the French title, we added a whole page (and a picture from the British TV serial) to explain the idea of the Babel Fish. The banana tree of the French title refers to an anecdote told in Chapter 15: in the first translation of the Gospel of Matthew into Malay, the parable of the fig tree was transformed into the parable of the banana tree (figs being unknown in Sumatra at that time). So the French title joins together the impossible fantasy of a universal automatic translation device with the historical reality of cultural substitution. Notice how a whole page was added by the author and the translator together, to explain by the French that English reference to a book little read in France. And the French title adds the allusion to a Bible translation problem. Yes, of course, and they were all resolved without difficulty. Most often Daniel accepted my version and sometimes I gave in to him. For example, he thought my translation and explanation of St. Jerome was wide of the mark, and he was right — his Latin is much better than mine. I thought his tone was sometimes too chatty, and I asked him to make it sound a bit more tight-lipped, which he did. To avoid using the French word équivalence to translate “pattern-matching skills,” I wrote a three-page addition in French to explain “pattern,” “match,” and “skill,” none of which have simple “equivalents” in French. Almost all of this was done by email, but we did meet on I think three occasions, in Paris and in Princeton, to talk through various issues — especially the title. I have had tremendous fun working with a brilliant translator, Daniel Loayza, to transform the book into something that we hope is as interesting for French readers as the English seems to be for you! Translation rights have also been sold in Spain, Greece and Korea. It seems that Bellos is letting translation mean the meaning of everything. And he’s allowed Laoyza to take the first shot, by French and in French, at practicing what he’s preached. The film version of Hitchhiker’s Guide (which I thought was dreadful) had 51.1% of gross from outside the US and Canada, so perhaps the term is more widespread than we might think. Theophrastus, I’m not sure I can agree with Bellos on his nearly-anything-goes approach. At the end of this long comment, I’ll state my objections more clearly with some examples of problems of translation bias. Doesn’t Bellos recognize limits? Yes, he does. At the UN, the system [of conference interpreting] is often invisible to users. Interpreters are placed at the rear or the side of the assembly hall behind soundproofed and tinted glass screens. You can attend a dozen meetings without even realizing the interpreters are physically present—so it’s only natural they should get taken for granted. What’s more insidious should get taken for granted. What’s more insidious than the occlusion of the interpreting magic, however, is the impression that anything you say can be simultaneously heard in all other tongues. Conference interpreting, glamorous though it is, buries the real difficulties—and the real interest—of language transfer beneath sophisticated, almost circuslike tricks of the language trade. It makes people think that it’s only a matter of time before we can all have a device to stick in our ear—the “Babel fish” of The Hitchhiker’s Guide to the Galaxy—to provide us with instant communication with all the peoples on earth. One of my strongest wishes in writing Is That a Fish in Your Ear? was to move “translation studies” away from always dubious judgments about “which translation is better” or which translator should be put in the stocks or have nails stuck into his effigy. I’ve tried to show that there is another way of doing translation studies that is much more interesting than the sniping that is such a large part of the tradition of translation commentary. See my chapter 30! By always saying some other thing a second time, and saying it in a different way, an act of translation inevitably makes the new utterance your own. A journalist rephrasing an agency wire, a lawyer-linguist readjusting the expression of an opinion given by a judge at the European Court of Justice, a writer putting Pushkin into English verse or prose—translators of these and all other kinds possess the outcome of their work in a personal way. Translation cannot but be, in some measure, an appropriation of the source. Possession, appropriation, making something your own—these are words from the language of the passions. What then of desire and its natural companions, jealousy and hurt? It’s a curious fact that much translation commentary in Western languages contains unmistakable signs of anger and hurt. Schoolmasters, book critics, even theorists routinely disparage other translators—bad translators, “servile,” “mechanical,” second-rate translators—with a range of insults that could easily be thrown about in a lovers’ tiff. You have a tin ear! You write dull, wooden, clunky prose! You have taken one liberty too many! What makes you think such license is allowed? What you have done, young man, is called betrayal! Ignoramus! Cheat! Commoner! Thief! Yes, I read it attentively the first time, but I missed what you were saying when you were critiquing Nabokov. No, I got the fact that you called his rendering of Pushkin “pseudo-literal translation.” That’s not exactly a fatwa, but it sure sounds like a snipe. However, I see now that your gripe is really is not so much with “Nabokov’s own nonrhyming translation of Pushkin’s novel” but with “Nabakov’s appropriation of it through his inflated peritext.” And it was his few “stanzas of Onegin into English verse in the 1950s already” that got him to this point: “He could see he was not Pushkin.” Thus, he arrogantly gives up real translation “literal” or otherwise to complain about translation, throwing out red herrings such as “mathematical impossibilities” and the like. Of course: in the War and Peace of translation and translation studies, let’s have more peace. You and your book are bringing to me that. Nonetheless, you (as a translator and author-teacher) have ironically given me reasons to be more critical, not less. The case of Nabokov is one I’ll stay with. It’s not so much whether the translation is “good” or “bad” — rather it’s what the translation is used for that matter much. I’m thinking of James Murphy’s translation of Adolf Hitler’s Mein Kampf, used to bring Americans to sympathize with Nazis and of the many English translations of the Bible that would keep women in religion and even in the home down. So when Figes trashes Edmonds’ translation of Tolstoy, this is free speech. And yet. Yes, it’s wonderful that Bellos includes Olympe de Gouges in his French edition (and how could he not?!). It’s wonderful that he can add three pages “in French to explain ‘pattern,’ ‘match,’ and ‘skill’.” It’s wonderful that he can add another page to explain the English title and the first part of the French title. And yet, it should be clear to French readers (and English readers too), that Bellos himself is, by Loayza’s title, focusing us more sharply on what Albert Cornelius Ruyl did. Ruyl made Matthew’s συκῆν or “fig tree” dynamically equivalent to pisang or “le bananier” or “the Banana Tree.” And, therefore, Ruyl (as Bellos puts it) “initiated the principle of cultural substitution that [Eugene] Nida would theorize and promote three centuries later” (page 174). Readers of Bellos’s book know how critical he can be of Nida, and rightly so. Some of that I’ve excerpted here. My point is that – even for Bellos, who practices generosity in reviewing “translation” – the principle of cultural substitution as translation may just go too far. By one of those strange coincidences that seem to happen all the time, the film version of Douglas Adam’s “Hitchhiker’s Guide” was recently shown again on British television. Having forgotten how bad it is, I recorded it, but once reminded watched very little. Of course, one typically finds that, say, the film version of a book isn’t nearly as good as the book, and even more so with books based on films. Although sometimes a film does improve on a rather disappointing book, I can’t think of a good book-of-the-film. The only case I can think of where an excellent book was made into an also-excellent film is Frederick Forsyth’s, “The Day of the Jackal”. If I recall correctly, the Douglas Adams books were based on the radio series. Of course, that is a special case, since the same author prepared both the script and the novelization. The movie is considered classic as well. There is a BFI Guide on it, the script adaptation (by Raymond Chandler!) is published (in Library of America and in an individual volume), it is on the American Film Institute’s top 100 American films list (#38 in their 1998 list; #29 on their 2007 list), etc.